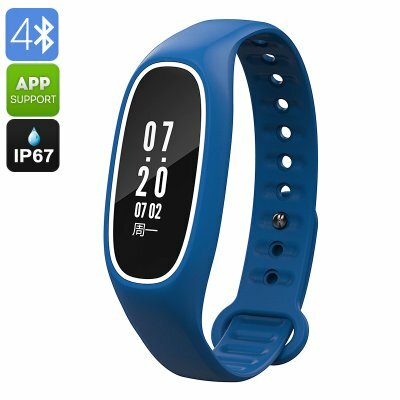 Successfully Added Fitness Tracker Bracelet DB01 - IP67, Heart Rate, Blood Pressure, Pedometer, Calorie Counter, Call Reminder, Mobile App (Blue) to your Shopping Cart. The DB01 fitness band is a high-end fitness tracker that treats you with a wide range of amazing smart health and fitness features – designed to support you during your upcoming workouts. With its IP67 design, this waterproof fitness band can be used in any environment or weather condition. It even comes with a specialized swimming feature for those of you that regularly like to hit the pool. Whether you’re into running, cycling, or swimming – this Bluetooth fitness tracker will follow you anywhere you go. Equipped with an accurate pedometer, the fitness band will keep you updated on the number of steps you took and the distance you covered throughout the day. Its calorie counter furthermore informs you about the total amount of energy burned and provides you with motivational info on how many more steps you should take to reach your exercise goals. The fitness band furthermore supports a heart rate monitor that keeps track of your heart rate while exercising. This, along with the fitness band’s blood pressure monitor, provides you with valuable information on which you will be able to adjust and optimize your upcoming workouts to your own capabilities. When paired with your smartphone through Bluetooth, this fitness tracker provides you with incoming call notifications to make sure you’ll never miss out on an important message again. Its 80mAh battery provides enough juice for 5 days of standby time – letting you use it through multiple days without needing to worry about running out of power in the midst of your workout. Compatible with both iOS and Android smartphones, this fitness tracker can be used with the majority of devices out there.